Why should you bring your team Sales business to soccer master? We are a family owned and operated business established in 1978. Because of our size and business model, we are able to establish great personal relationships with our customers, and we are able to give what we feel is unmatched service. Soccer Master ranks as one of the best soccer specialty stores in the US and with that comes a strong committed Team Sales relationship with our vendors, which allows us to offer our customers the ultimate selection of products and support. Our 40 years of experience and loyal long-term customer base tell us that we have a good formula. Our goal is to deliver uniforms on time under whatever structure our clients desire at a highly competitive price. We do not dictate how we let our customer tell us how. Already On A Team We Do Business With? Log-In To MyUniform Below To Search Your Team Store. 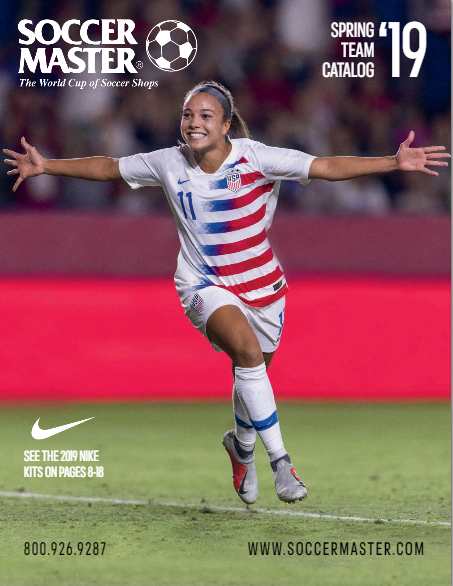 Checkout our new 2019 Soccer Master Spring Team Catalog Now! Team Pricing: Prices shown are based on a minimum purchase of 6 pieces. Please call for quotes and exact pricing. All prices are subject to change at any time. We reserve the right to adjust our pricing in the event that we have made an error in this website. Delivery: All orders are shipped UPS ground unless Next Day Air or 2nd Day Air is requested. 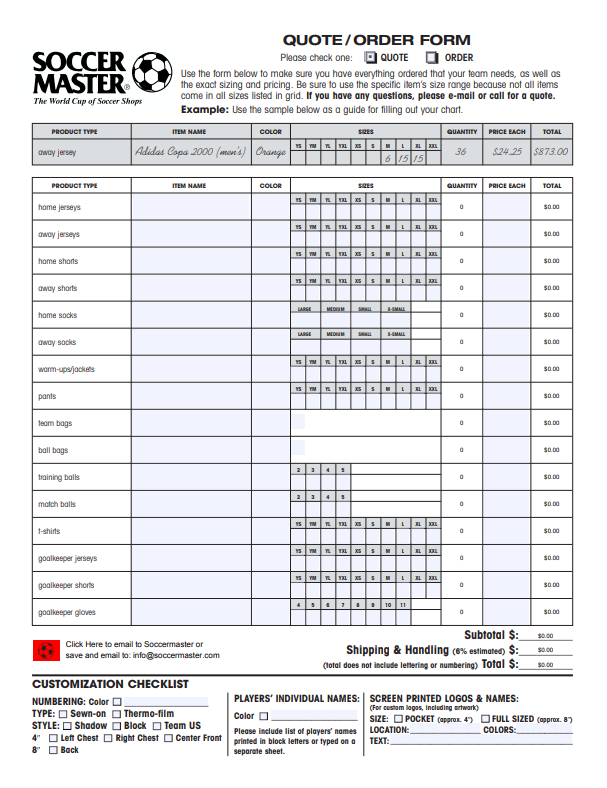 Shipping charges are based on weight, and the number of packages, so please ask for a quote. Additional shipping charges will apply for Next Day Air and 2nd Day Air services. Also, it is possible that your order will be sent directly to you from the manufacturer. This is usually done for orders that require no lettering on our part, or if you have a local source for lettering and numbering. Payment: Soccer Master accepts MasterCard, Visa, Discover, and school purchase orders. In addition, we welcome league, club, and team checks secured with a credit card. A deposit will be required at the time an order is placed. Return checks will be subject to a $20.00 bank charge. Returns & Exchanges: Returns and exchanges are subject to a 15% service charge. All printed or embroidered sales are final unless such merchandise is defective. Customer Service: We are committed to having the best customer service department. If you have any questions or comments on an order or other business please call 1-800-926-9287 and press 2 for TEAM SALES. Order Early: Don’t wait until a couple of weeks before your season to begin your ordering process. The normal turnaround time for a team order is 2-3 weeks. You will also have to allow an additional 10-14 days for the lettering and numbering of your order. Soccer Master is able to provide a full range of lettering services, including silk screening of logos, thermofilm numbers, sewn-on numbers and letters, as well as embroidery work. 1. Fall season (this season runs from July 1 through September 30). 2. Holiday and Indoor soccer season (November 1 through January 31). 3. Spring season (February 15 through April 1). During these times of the year, the majority of customers are attempting to do their purchasing, so please order early or allow a 30 day turnaround time. Plan Ahead For Any & All Possibilities: Planning ahead for any unforeseen circumstances is an important way to avoid problems when purchasing your uniforms. Always consider the maximum amount of players you have on your team. If for some reason, your team does not have the maximum number, or even if it does, you may want to consider purchasing extra uniforms. Having a few additional uniforms will allow your team to deal with any situation, such as new players, loss or damage. Having additional uniforms on hand will spare you from having to worry about future availability as well as the extra costs associated with single-piece orders. Thank you for taking the time to read these Helpful Hints for Team Ordering. We look forward to helping you and your team with all of your soccer needs. Have a great season!